Q: Does Barack Obama have any siblings? A: Obama has a half-sister, Maya Soetoro-Ng. She is a teacher and professor in Honolulu. Q: What part does Michelle Obama play in her husband's presidential campaign? A: Completely at ease talking with crowds, she tirelessly campaigns for her husband and speaks of him and the election issues with passion and courage. Q: Does Barack Obama have any children? 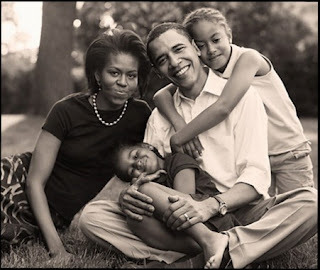 A: Barack Obama has two daughters, Malia and Natasha. They are currently being cared for by their grandmother, but Michelle Obama tries to fly home every night to tuck them into bed. Q: Who are Barack Obama's parents? A: Barack Obama was born in Hawaii on August 4, 1961, to Barack Obama, Sr. and Ann Dunham. His parents met while attending the University of Hawaii, where his father was enrolled as a foreign student. Barack's parents eventually divorced, and after his mother remarried, he lived in Indonesia for a time before returning to Hawaii to live with his grandparents. He later moved to New York, where he graduated from Columbia University in 1983. Q: What is Obama's religion? A: He is a Christian who has attended Trinity United Church of Christ for nearly 20 years. Q: Is Barack Obama a Muslim? A: No, he is not a Muslim, he is a Christian. While his grandfather was a Muslim, and this father an atheist and his mother an agnostic, Barack has been an actively practicing Christian for nearly 20 years, attending Chicago's Trinity United Church of Christ. Q: What nationality is Barack Obama? A: He is American, born in Hawaii on August 4, 1961, to Barack Obama, Sr. and Ann Dunham. His parents met while attending the University of Hawaii, where his father was enrolled as a foreign student.